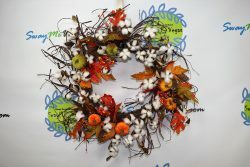 Fall Cotton and Pumpkin Wreath Celebrate Fall with the traditional grapevine wreath full of cotton bolls, pumpkins, fall leaves and so much ..
Fall XL Grapevine Sunflower Wreath Are you ready to say goodbye to vibrant colors of summer and welcome the beauty of fall leaves, pumpkins, ..
Fall Fabric Pumpkin Rag Wreath reet your Fall Guests with this custom Rag Wreath! 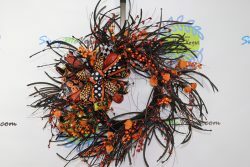 This hand tied custom wreath is topped with a bow made .. 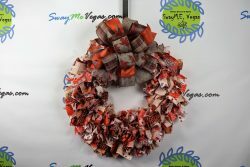 Autumn Orange Brown Fabric Rag Wreath Welcome in the Fall season with this custom Rag Wreath! 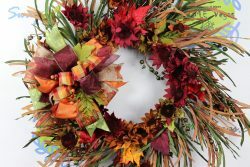 This hand tied custom wreath is topped with .. 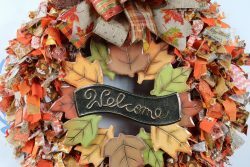 Welcome Fall Fabric Rag Wreath Welcome!!! Fall has arrived, cooler temperatures, leaves that change into vibrant colors of fall, and all things .. 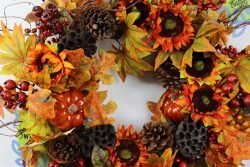 Harvest Fall Sunflower Wreath Are you dreaming of pumpkin spice, the abundance of trees and the rustling of leaves under your feet because ..
Halloween Candy Corn Grapevine Wreath Happy Spooktacular Halloween! 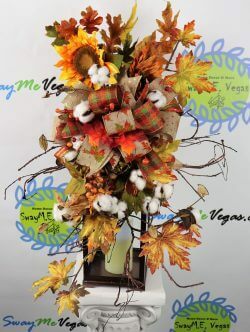 Celebrate the start of the halloween season with this blazing extra ..
XL Fall Sunflower Lantern Swag Welcome Fall into your home with this extra large fabulous cotton and sunflower lantern swag. 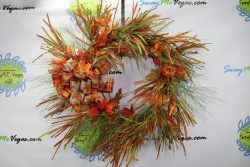 This beautiful ..
Fall Pumpkin and Grass Wreath This fabulous wreath is a statement piece. 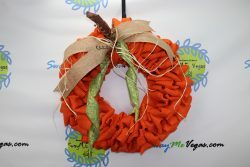 This one of a kind wreath measures 36″ in diameter from tip to tip and is made ..
Burlap Pumpkin Wreath Happy Fall!!! 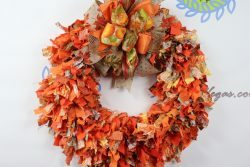 Celebrate the beautiful colors of fall with this pumpkin inspired burlap wreath. . Made on a 18 inch ..